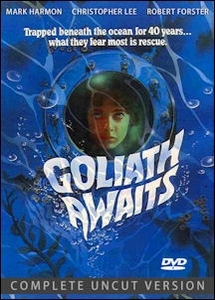 Goliath Awaits DVD (Region 1) Color. Complete & Uncut. 2-Disc Set. 194 Minutes. Mark Harmon, Robert Forster, Christopher Lee, Eddie Albert, Alex Cord, John Carradine, Emma Samms. When the luxury liner Goliath is torpedoed during World War II, it is sunk with a Nazi file whose secrets could destroy the free world forever. In the tradition of The Poseidon Adventure, there's moment-to-moment tension with two divers who face certain death when they are sent on an underwater covert mission to retrieve the evil Nazi document. Through a rust encrusted porthole diver Peter Cabot (Mark Harmon) sees the impossible: a tortured face of a hauntingly beautiful girl (played Emma Samms) still alive after forty years. Controlled by a remorseless madman Christopher Lee, the tyrannized mutant survivors reveal the secret source of Goliath's monstrous power--the bestial ship's insatiable boiler feeds on human blood of the passengers. Overwhelmed by evil forces, the divers began fear they are doomed to spend eternity in the ocean's depths as victims of the bloodthirsty Goliath.